Pitching options for a square tarp, specifically for hammock camping. I think a square tarp is probably the most modular for hammock camping because it can be pitched in so many different configurations. It really is a workhorse item because you can create nearly everything from a fair-weather sun shade to a storm-worthy, snow-shedding A-frame fortress. Keep in mind that you’ll need to carry a little more guy line and a few stakes in order to configure some of these options. If the tarp is the right size (as large or larger than 10×10 ft/3.05×3.05 m), you can hang multiple hammocks under one tarp to share some gear and save some weight. Good article and illustrations. Could you recommend a UL tarp? I have been searching for an UL square tarp for hammocking and ground use and I’m not having much luck. Brian over at OES Equipment has something close off the shelf and he might do a custom for you. I’d also contact Jacks R Better. I have the DD superlight tarp. Weighs next to nothing but is a bit on the expensive side. Bearpaw Wilderness Designs. His tarps are amazing quality, fast service, nicest guy you’ll ever do business with. I like the origami pitch idea. See origami 10 X 10 on youtube. Can form a tent with sheltered door with no flapping sections. In real life I just threw tarp over ridgeline leaving ground edges a foot or so above ground so 360 views lying down. No bugs ar night in High Sierra so no net. Best ground shelter I used before hammocks. With hiking poles to prop it open where you want to see out, a square tarp works just as well as a hundred and fifty dollar one. You might end up having to tie it to the top of your pack when hiking in and out due to the size, but it isn’t really that big of a deal. As long as you make sure it is sized correctly and waterproofed, a $10.00 square tarp can be all you need for your rain protection. This is so helpful thanks!! Getting the hammock up is one thing, getting the tarp up, a whole other ball of wax. Ak! Any pointers on using a poncho tarp? The hood in the middle is a bit tricky. Using what I’ve got at the moment. I have often used a poncho tarp when hammock camping. As long as your hammock fits underneath, it makes a good asymmetric tarp. I use a GoLite poncho tarp, which is now unavailable. I use the draw cord of the hood to gooseneck the hood and tie it off to seal it. Any suggestions for a tarp without polyurethane coating? Is my only other option silnyl? Hoping to find something cheaper than silnyl. As usual, your articles find me just when I need them. I have an asym diamond tarp (on your earlier recommendation), but the one I have does not have intermediate tie out points. I also have a hex tarp with doors (on almost everyone else’s recommendation). I’m thinking I need something more versatile for trips where I’m likely to camp a day or two above treeline or at the beach/desert, so something that will work for a hammock, but also on the ground. 10×10 seems too big for me. 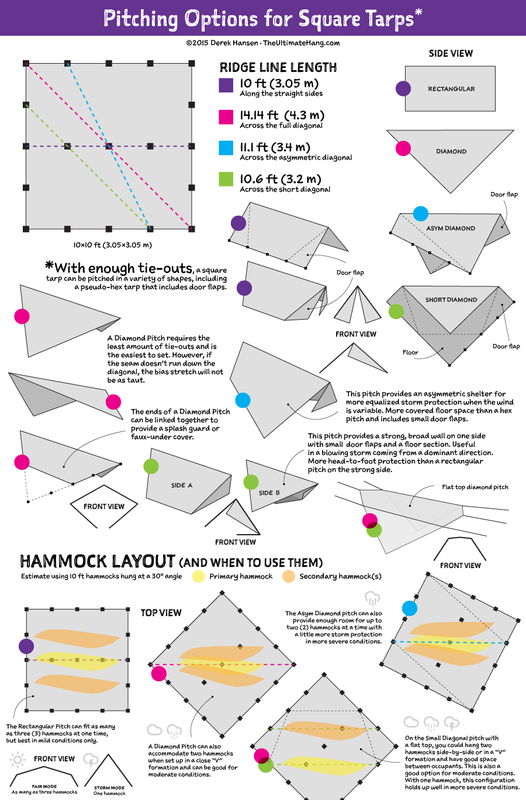 I realize some of these pitches won’t work with smaller tarps, but what do you think of a 7×9, 8.5×8.5 or 8×10 tarp? An 8×10 or 9×9 would be good. Go Outfitters tarp is pretty versatile for a good price and has lots of tie outs.